As we kick off a new year, many of us are trying our best to keep our resolutions—whether to eat healthier, exercise more, or work toward our academic and career goals. 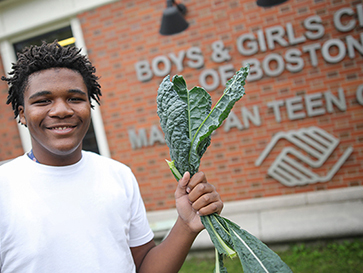 At Boys & Girls Clubs of Boston, our members have a head start. BGCB’s Health360 Initiative, our holistic health and wellness strategy encourages members and staff of all abilities to engage in daily physical activity, make healthy nutrition choices, employ good decision-making skills, and avoid risky behaviors. Our Clubs serve more than 315,000 nutritious snacks and meals to members each year, which are often the only hot meal of a child’s day. Our Clubs also offer a variety of physical activities including dance, yoga, Zumba, running clubs, sports teams, and aquatics. Our members are set up for academic success as well, through a range of programming including Power Hour, which helps members complete their homework as soon as they arrive at the Club. Last year, 93% of members (ages 6–18) were reading at grade level, with 80% earning mostly As and Bs on their report cards. We’re off to a great start this year, too! Follow along with Club accomplishments all year long on Facebook, Instagram, Linkedin, and Twitter.